Did you know that the Brooklyn Bridge is one of the oldest suspension bridges in the whole of the United States of America? Also, did you know that more people jump off this bridge than dinosaurs? Just ask any of the idiots in this Thriller Directed by Asger Leth; and Starring: Elizabeth Banks, Sam Worthington, Jamie Bell, Anthony Mackie, and Ed Harris. Particularly in 2012 and for 102 minutes. 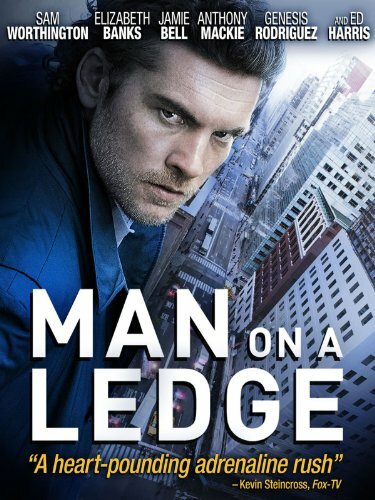 Within a one month period of time, ex-cop, Nick Cassidy (Sam Worthington), goes from becoming a convicted diamond thief, to an orphan, to a man ready to jump off of a very tall building to make a very bold statement instead. Of course, it could be a lot worse for Nick don't you know. He could be in his brother's shoes, Joey (Jamie Bell). As this poor sod and his girlfriend, Angie (Génesis Rodríguez), are currently breaking into a vault belonging to prune-faced businessman, David Englander (Ed Harris), so that they can prove Nicks innocence. Yet again, he could also be the pointed shoes of the poor cow that has to talk him down from jumping in the first place, Detective Lydia Mercer (Elizabeth Banks). Admittedly, Lydia has had some bad experiences with jumpers in the past. Plus she isn't having a great time of it at the moment with her boss, Jack Dougherty (Edward Burns), due to this fact. Still, that's how this game is played for the next tense hour or so, with Joey and Angie penetrating David's building nearby, whilst Lydia does her best to figure out whom Nick is and what he is up to. Well, that is until Nick's ex-partner, Mike Ackerman (Anthony Mackie), turns up at the scene. And is most probably why what next transpires all kicks off when a bomb alert goes off? As diamonds see the light - brothers get into a fight - jumpers jump - and at the end of the day, the good guys cheer, leaving the bad guys getting the hump. Now 'Man on The Ledge' has had a mixed bag of reviews since it came out earlier this year -- 2012. And do you know what? I could understand why once I sat down and watched this movie. Well, its one of those good / bad movies, isn't it? With great ideas, but with a rather hollow execution. Listen, I do not want to bad mouth this flick for the sake of popularity. Oh no! I just want to give my honest opinion about this piece, in my usual advantage / disadvantage way. ADVANTAGE: (1) I enjoyed the scenes were I got to see how high-up Sam Worthington's character, Nick, really was. And for the life of me, I could not tell if it was all blue-screened or shot for real. Nicely done. (2) The genesis behind this story reminded me of an updated version of an old heist movie -- just with a more innovative take on the execution and the overall narrative. This was very creative I thought, and very new too. (3) All the actors in this film did a fine job with the script they hand. Elizabeth was her ever charming self. Sam was brooding and dulcet. Jamie and Génesis worked very well together. And I would have liked to have seen more of Anthony, Ed, and Edward as well. (4) The initial twenty minutes of this film was very intriguing to watch, as it had that 'What the f*ck is happening' vibe to it. But alas, at about the thirty minute mark... well... it's time for my disadvantages I think. DISADVANTAGE: (1) Now conceptually this thriller is a fairly decent tale. Man wants to prove his innocence, and he does this by instigating a very bold ploy with some people he can trust. However, the dual approach this journey takes is rather jarring at times, and does not give each story-strand enough girth to feel complete as an entity in its own right. Too cosmetic, and with not enough substance either. (2) This piece relies heavily of the good guys being that much smarter than the bad guys, right? But I am afraid to say that they do come over in this way. Lucky -- but not smart. (3) As much as I loved looking at Génesis Rodríguez 'assets', I do feel that this was included as nothing more than titivation within the scheme of things. Exploitative, tut-tut-tut. (4) The relationships within this movie appear to work on a fleeting level -- nothing is expanded upon, and only hinted at in wry looks and coy comments. (5) One of the major drawbacks with this adventure is how things are either delayed or put on the back burner until another part of the tale is told. All in all I felt that this 'tactic' works in determent to the pace, the narrative, and the overall structure of this project -- making things confusing and laborious to say the least. (6) Now I really do hate pat endings to a film, and this one had it in spades -- big time. OK, so what's that make it? 4 to 6 against! Oops! Maybe that's a tad too harsh. You see, 'Man on the Ledge' isn't that bad-bad a movie, it's just a movie that could have been better if handled in a much more personable manner. I wonder if these filmic-facts can shed some light as to why this is so. (1) It was rumored that Amy Adams was once considered for the role of Lydia. (2) Elizabeth Banks real name is Elizabeth Mitchell. She changed it to avoid confusion with the actress / model of the same name. (3) This was directors, Asger Leth, first major film. Previously he was a documentarian / cinematographer. (4) Sam Worthington was born in Surrey, England, and moved to Western Australia with his British parents when he was six months old. (5) This film cost 42 million dollars to make, and it made roughly same at the box office. Give or take a thousand. (6) The first time Edward Burns was involved with a movie, was when he was a production assistant on the Oliver Stone film, 'The Doors'. 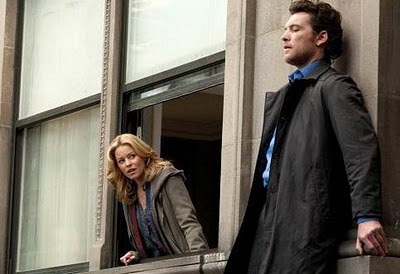 (7) In this picture Elizabeth Banks character tries to help a wrongfully convicted man prove his innocence. She once played the other side of this equation in the movie 'The Next Three Days'. (8) Ed Harris' first film role was as a patient in the 1978 drama 'Coma'. (9) Anthony Mackie was once an understudy to the actor, Don Cheadle, in the play 'Underdog / Topdog'. (10) By in large this thriller did not receive much critical feedback -- Rotten Tomates rated it at 31% based on 145 reviews. (11) Jamie Bell became famous for his role in the dancing film 'Billy Elliot'. He learnt how to dance because he accompanied his sister to her ballet lessons. OK, so 'Man of the Ledge' would have been a lot shorter this way, granted. But by God, it sure would have been a lot more funnier. Agreed Jamie and Genesis?